CRDC Life sells a variety of Products on Amazon. They recently shipped me a Bluetooth speaker to test out. It’s designed to function in outdoor scenarios, and it purports to be dust resistant (which I can’t test), and it is encased in a soft plastic/rubbery exterior. The handset is accompanied by an auxiliary jack, and a charging cable Let’s see how it performed for me. 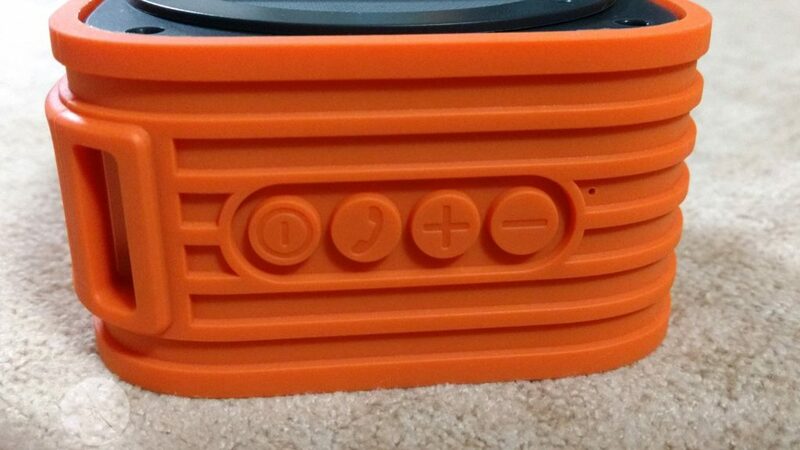 As I mentioned already, this speaker is black on the top where the grill is located, as well as the bottom, where 5 the branding is stamped. The other four sides are encased in that soft, presumably shock absorbent exterior. There are lanyard holes in one corner comma and for operational buttons that are also covered by the same protection. I was sent the device that was colored in Orange for its rubbery exterior, but they also sell one in black. While my personal preferences would be for the latter color, the orange would be serviceable were I to go somewhere where I intended to be outdoors all day, as I suspect this brighter color would be easier to spot. The unit feels slightly light for its size, as well, though that may be due to the “shock absorption”. 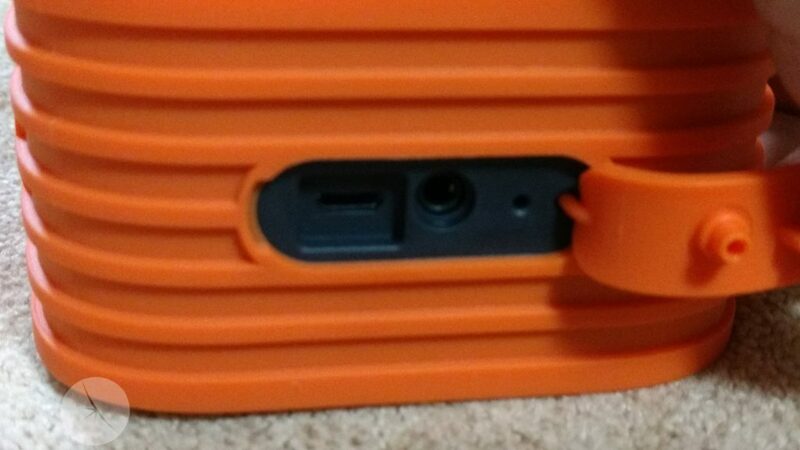 There is also a flap that can be opened up to reveal the charging port, 3.5mm aux port, and a pinhole for resetting. The device charges via micro USB. The performance of the device was serviceable. Pairing the device was fairly straightforward, and that I only needed to press and hold down the power button for a couple of seconds, and it paired swiftly with my phone and tablet. That same button also works as a toggle for playing or pausing your audio. I tested the battery life, which claims 10 hours of use, over a couple of different sessions, and found that it lasted over thirteen hours. Considering that it is supposed to be used for the outdoors, I decided to both test it by dropping it while in use from several feet off the ground onto a concrete sidewalk, as well as to see how far the range would succeed with Bluetooth. For the drop test, I was listening to music over the speaker while I held it about I level, and I stand a little under 6 feet tall. I dropped it straight on the ground (with an organization side facing down) and it did not appear to miss a beat, nor do I see any significant scuff marks on the orange covering. For the range test, I set my tablet down and and began to walk away from it, while holding the speaker in hand while walking away. I was able to exceed the thirty get that they claim, getting closer to sixty feet. Being a speaker, how it sounds is what’s most important to me. On its own, it didn’t sound bad. So, I’ve heard better and worse from other Bluetooth speakers that I’ve tested. The volume was ample enough, but the quality seemed to lack a certain depth to it. Not completely tinny, but it lacked a bit of punch at the lower end of the sound spectrum. Using its speakerphone capabilities, it performed well enough. The person I called sounded clear and full. As for how I sounded, it depended almost exclusively on whether or not I had love of sight with the microphone (a small pinhole in the rubbery exterior. When the mic was visible, I apparently sounded identical to how I normally do on my phone (and I get no complaints there), at arm’s length. On the other hand, if the mic is facing away, I sounded appreciably more distant to the caller, even when held closer to me. So, bear this in mind should you plan on making it receiving calls with it. So I have to score this as a 7. The battery lived up to more than its billing, the range that it could work from was double what was promised, and callers sounded great. Yet, music was a touch lacking, and I had to keep an eye out for the microphone, when it could’ve been placed on top of the device for a more onnidirectional effect. 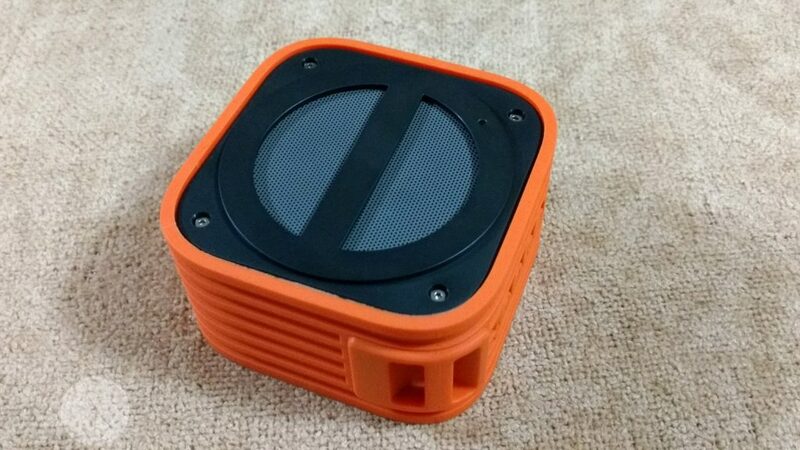 For those interested in this speaker, CRDC is offering a code for people to use, that gives a forty prevent discount through the end of this month. Use Code: CRDC1067 in order to apply it.